It's Wet and Wild and Wonderful, its WATER! Hi everybody, its Desiree! I hope you will check out my link. I opened up my sketching blog that was originally only available to my students. Its full of tips and some tutorials. I hope you will decide to follow it too! Wow, there are just so many ways to go with this theme, I love everything about this precious resource! It actually is life itself! 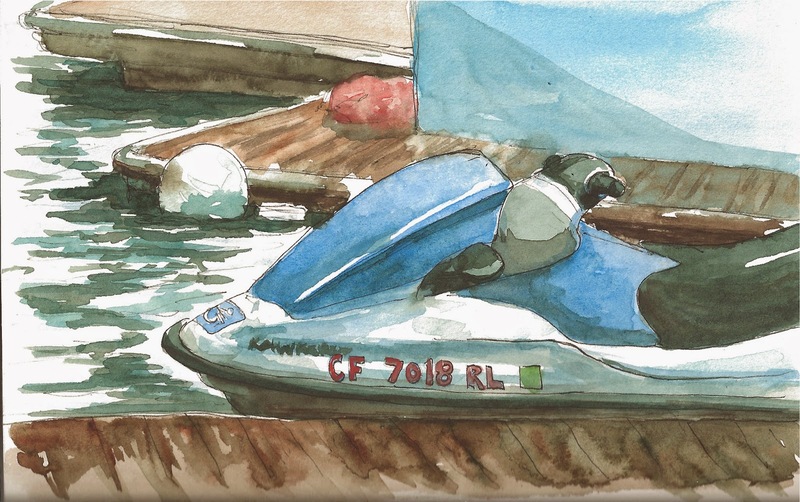 Water is an interesting thing to paint or sketch too. It has so many unique properties, it is reflective and absorbing, clear yet has colors, distorting and magnifying, and so many more. 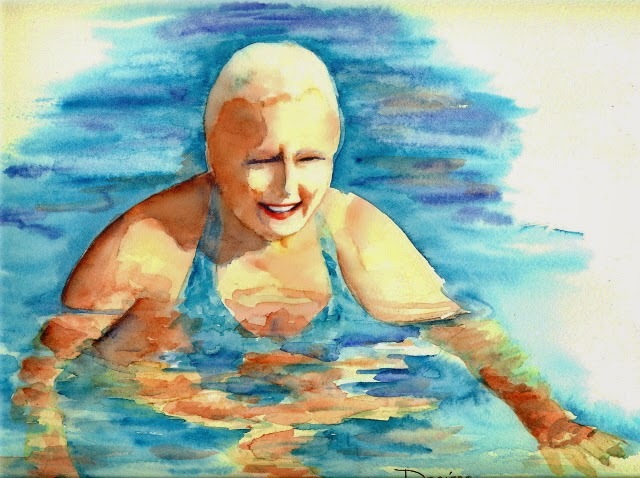 It is challenging and alluring as it calls us to all take up the challenge of painting water. 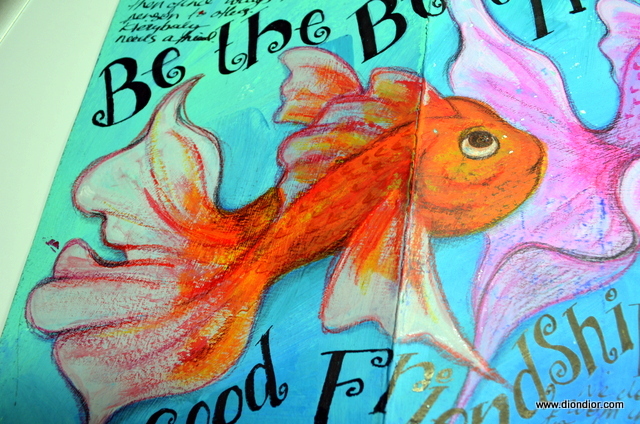 Why don't you pick your favorite way to enjoy water and lets paint something in our sketchbooks! 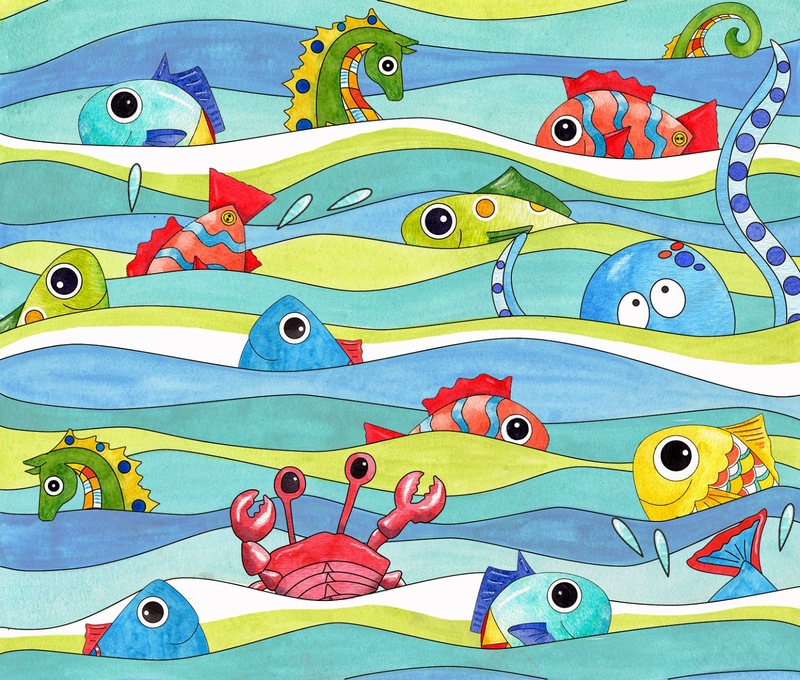 There are just so many wonderful ways to depict water in your sketchbook so lets look at some of them here. I then took it to pattern form and developed some Mug Rugs for my Mug Rug club. It also became a big part of my newest art quilt called "Reflections of our Fathers" for The dinner at Eight Exhibit in Houston this year. The water puddles reflecting these men. I hope you get to see it in person this year at Houston, read more about it on my blog here. 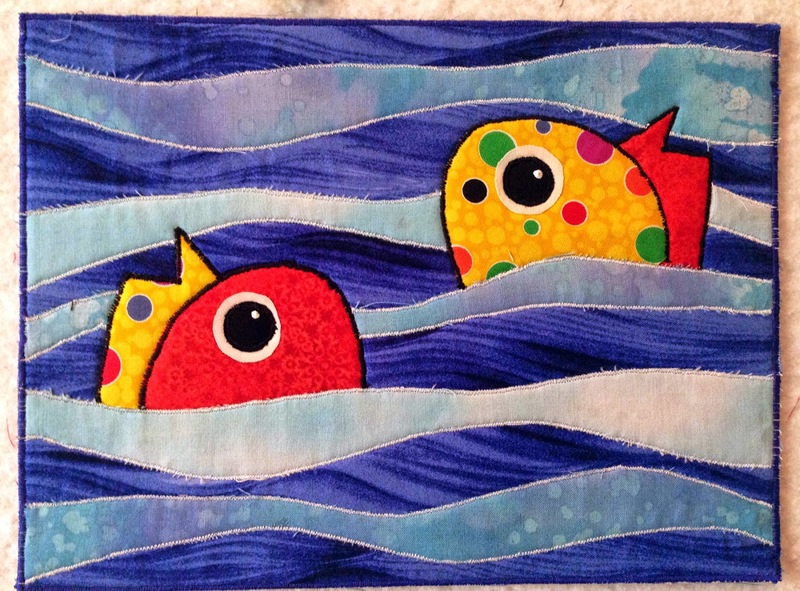 Water is a wonderful, magical theme for our sketchbook challenge, where will it lead you!? 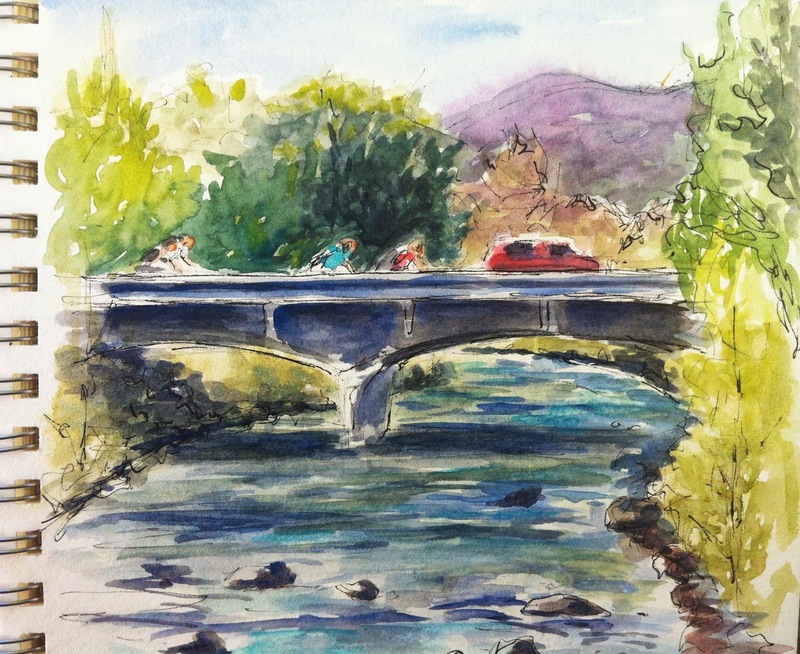 Check out my sketching and painting retreat being held in Northern California this October. More information is on my blog on the right side! Happy Sketching!!! Hi, Dion Dior here. 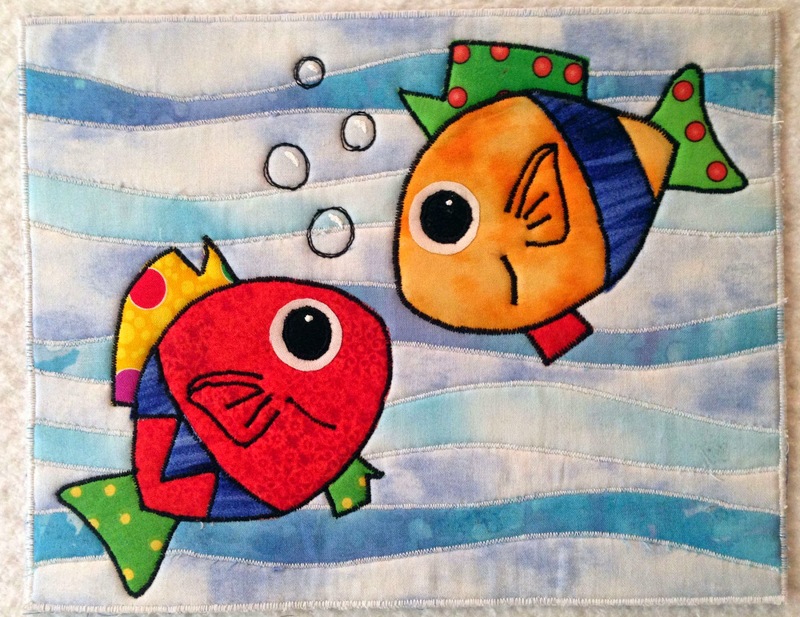 This month's theme is "Water", and what better way to celebrate the theme than with fish. Being an Aussie, I naturally love the ocean, and many years ago had a passion for scuba-diving (as many Aussies do). I've dived all over the place, but apart from the Great Barrier Reef off the far north coast of Australia, my next favorite place to dive is the Gulf of Thailand. Crystal clear water, incredible tropical fish and reefs that will literally take your breath away. 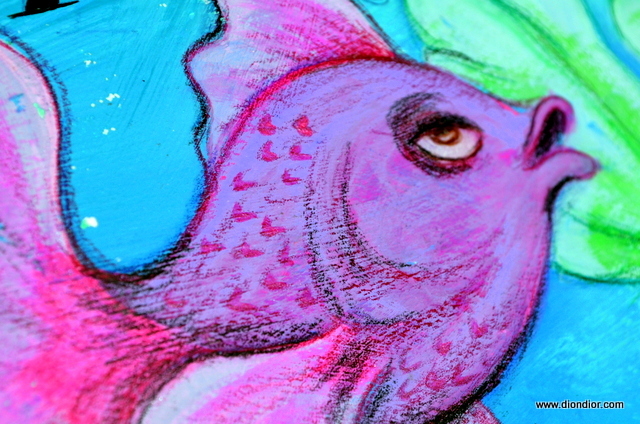 I don't dive any more, but I still have a love affair with the ocean and the beautiful creatures that dwell within it. 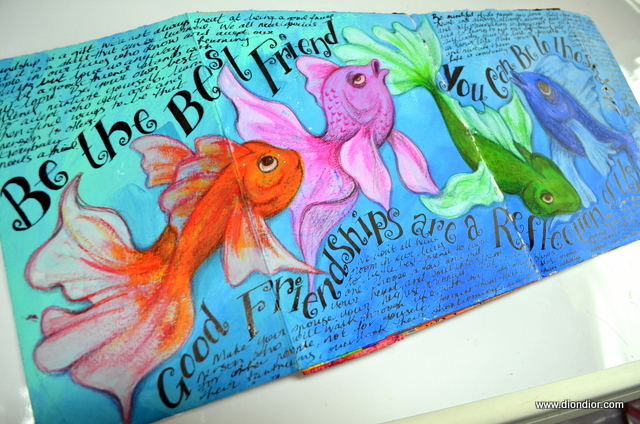 So, for this month I thought I'd share an art-journal page I call "Friendship Fish". This spread was done in a journal that I made myself. I don't often make my own journals these days, I have so little time and there are some beautiful sketchbook options around that are very high quality. (This one is my favorite). 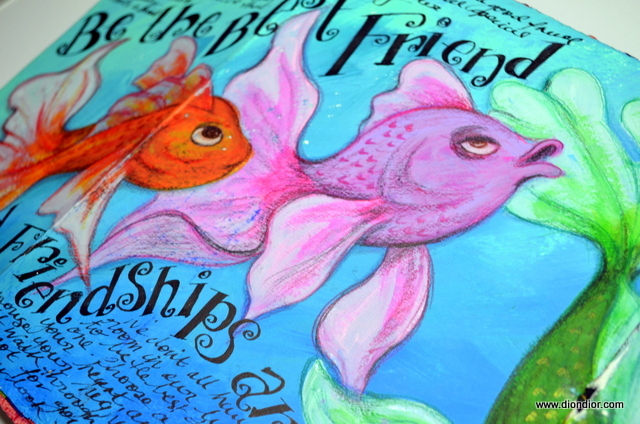 "Friendship Fish" was done in acrylic and watercolor pencil with ink writing. It is a metaphoric celebration of a lovely circle of women I love. Art journals and sketchbooks can be so many things to so many people, I hope you have a ongoing habit with your sketchbook. 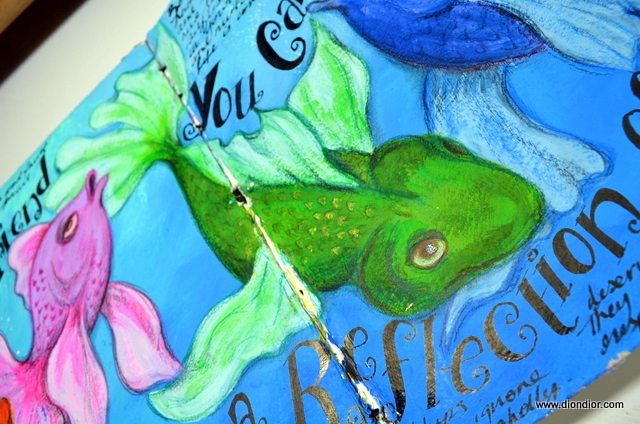 Please share your images from this months theme in The Sketchbook Challenge Flickr Group, and don't forget to tag it with the code jun638 so it can be included in the end of month slide slow on this blog. 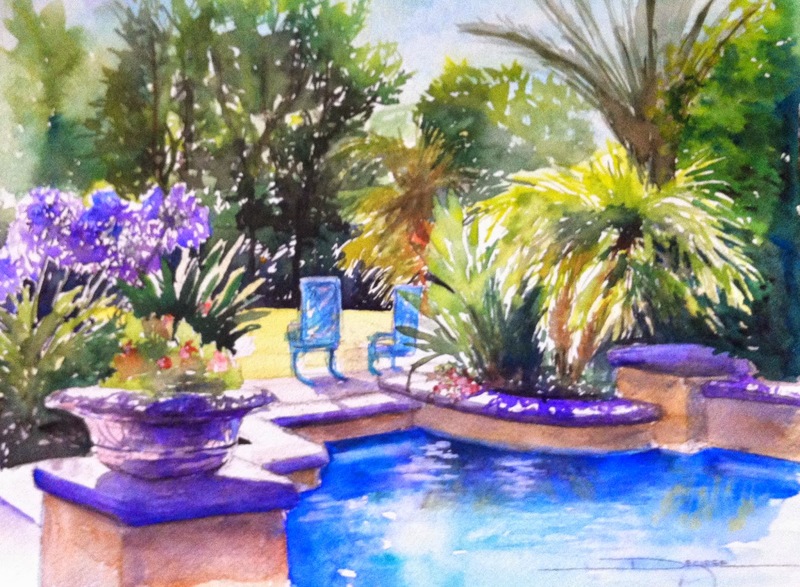 And don't forget to stop by my blog to join in Friday Sketches or browse any of my class offerings, including the upcoming "Watercolor Pencils" online class. 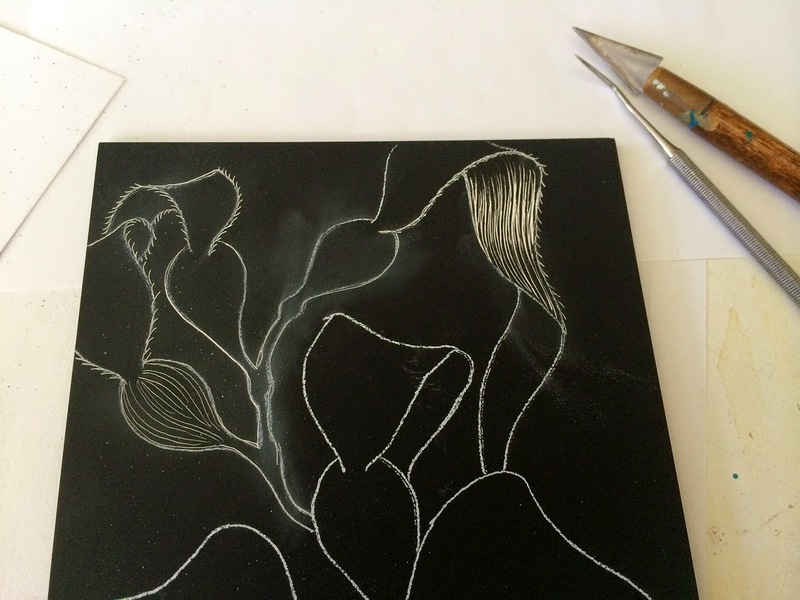 Water of life, what an open subject to have fun with; firstly I found some gelli plate prints which looked nice and watery and then I began to stamp and doodle. These are some of the tools I used, a makeup sponge, a stamp made from 'quick print' a type of polystyrene similar to that in pizza boxes, a stamp made using moldable foam. Then I finally added some lettering on a coloured piece of vellum type paper. On the next page I started with ink and then rubbed in some black shoe polish (just because I had seen it used recently and had an old tin of wax polish). I doodled around with white pens and paint and then found a few suitable images and words from an old book which I added using Mod Podge. 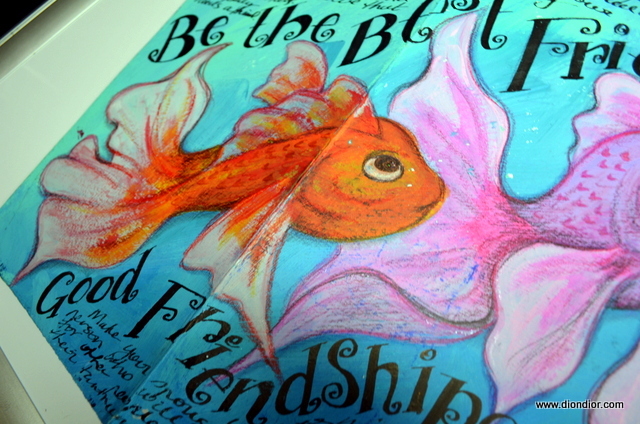 I then added some lettering which I wrote onto tissue paper. I like the way tissue paper almost disappears and enables one to see the shapes and images underneath. Just make a start and see where the tide takes you, Jackie. 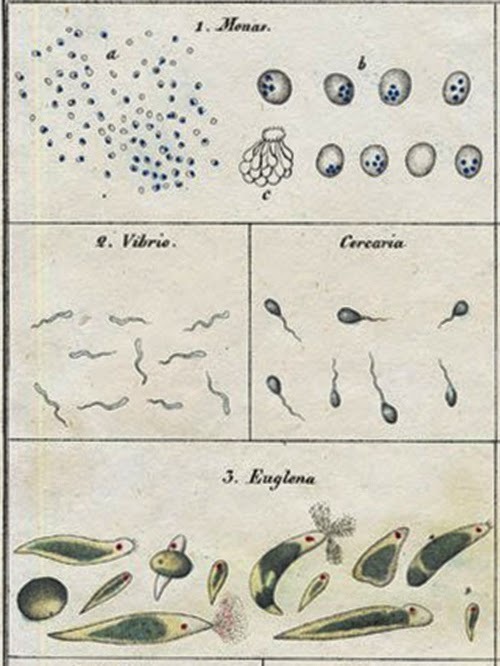 Originating in the primordial soup at the genesis of our planet, all life began from single cell protozoa and evolved into the complex creatures that now populate the earth. Water is life, without it there would be none, even we begin life in the waters of our mother’s womb. 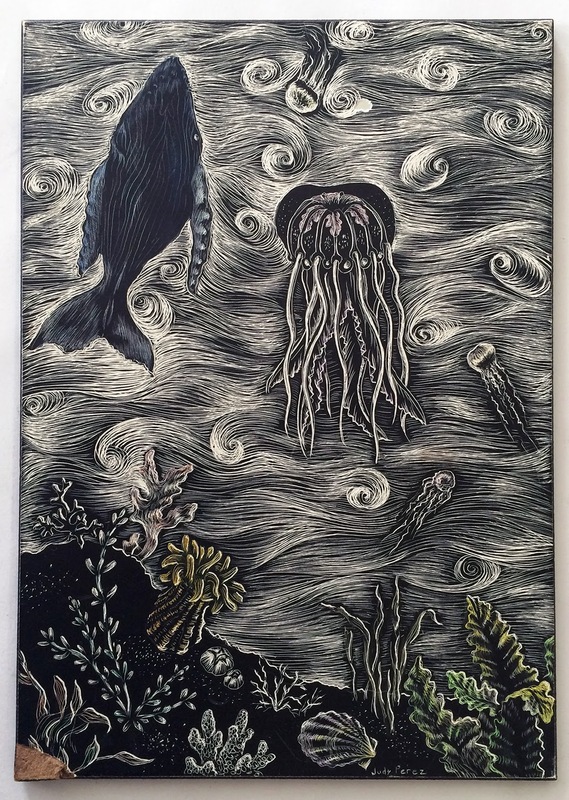 Thinking about this theme, I remembered a scratchboard I made several years ago of an ocean scene and thought it would be fun to revisit that technique and the challenge of working in a method that is so contrary to how we usually create. 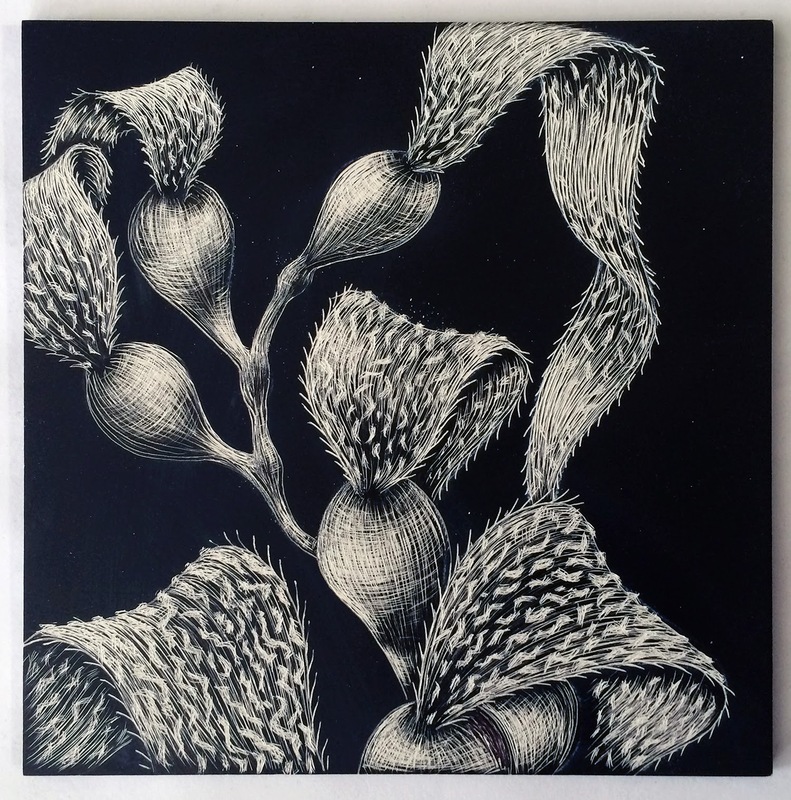 Scratchboard is a thin masonite board covered with china clay and a layer of back ink. Most often when drawing or painting we start with a white page or canvas and add deeper color or value to it for shading, to create depth and form. 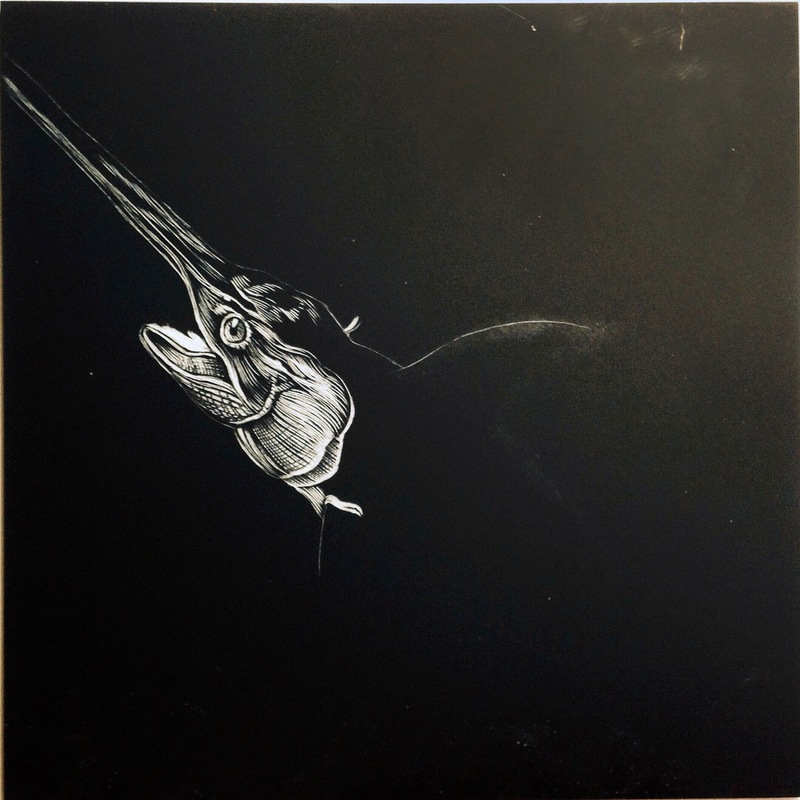 With scratchboard your darkest values are already there, to create an image you remove color, black in this instance, to create tints and highlights. 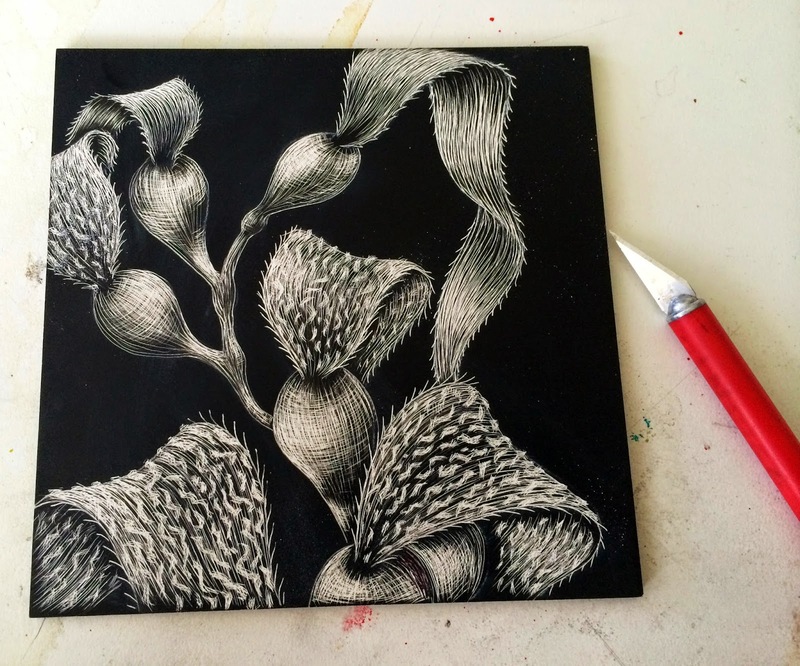 Working on scratchboard definitely challenges you to think about value and work in the negative. You have to consciously avoid removing too much of the dark areas and build up scratches to create lighter areas and highlights. It is the exact opposite of how we are used to working. I had a teacher in art school who once made us cover a huge piece of paper with charcoal and use a kneaded eraser to remove black in order to draw the still life in front of us. It was a powerful exercise in seeing. 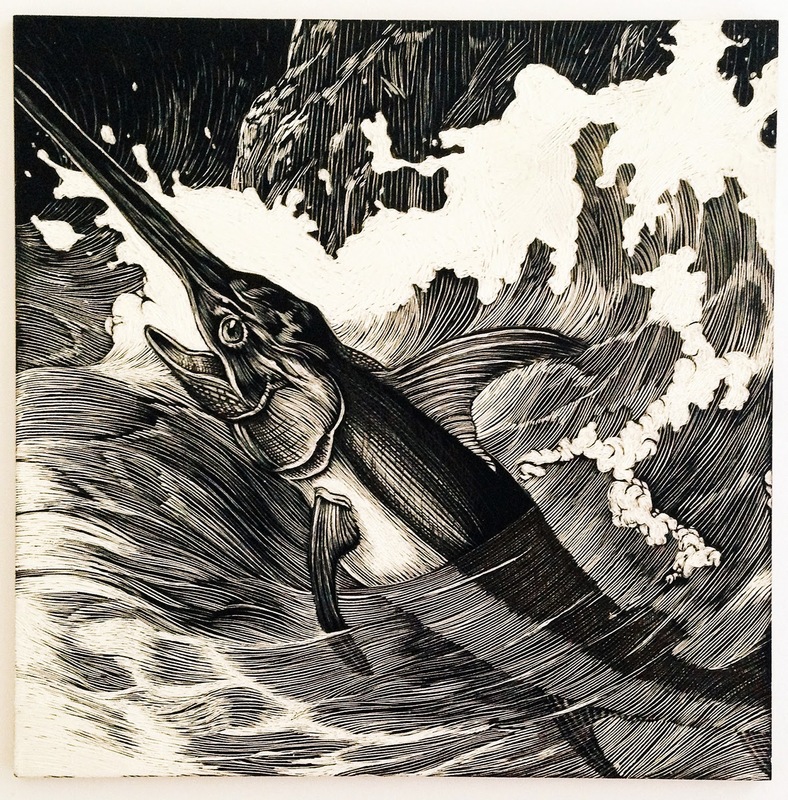 To create my new water inspired image, I bought a package of 5” square scratchboards from the art store and gave one to my daughter Indigo and took one for myself and looked around the studio to see what kind of tools I had on hand to work with. 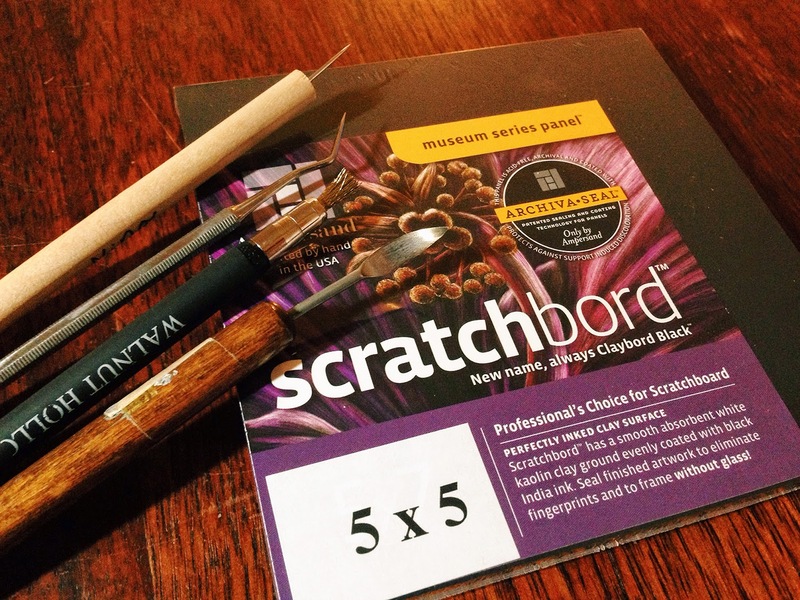 You can buy tools made specifically for scratchboard, the simplest tool being one that looks like a dowel with a needle sticking out of it. Indigo happened to have one, but I didn’t, so I used a bent pointed tip dental tool I use for sewing. A straight tool would work better than a bent one, but that’s what I had, I also used the tip of an exacto knife. Wire bristle brush tools or steel wool work great too, for scratching away large areas of background. I decided to draw brown bull kelp seaweed, commonly found on the beaches of northern California. 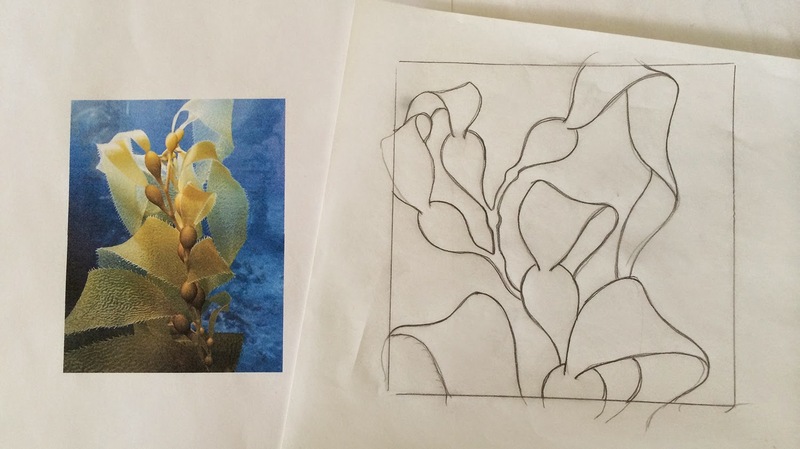 I found an image on the internet as reference to get the basic shape and proportion of the kelp, as well as show me where light and shadow give the form dimension. 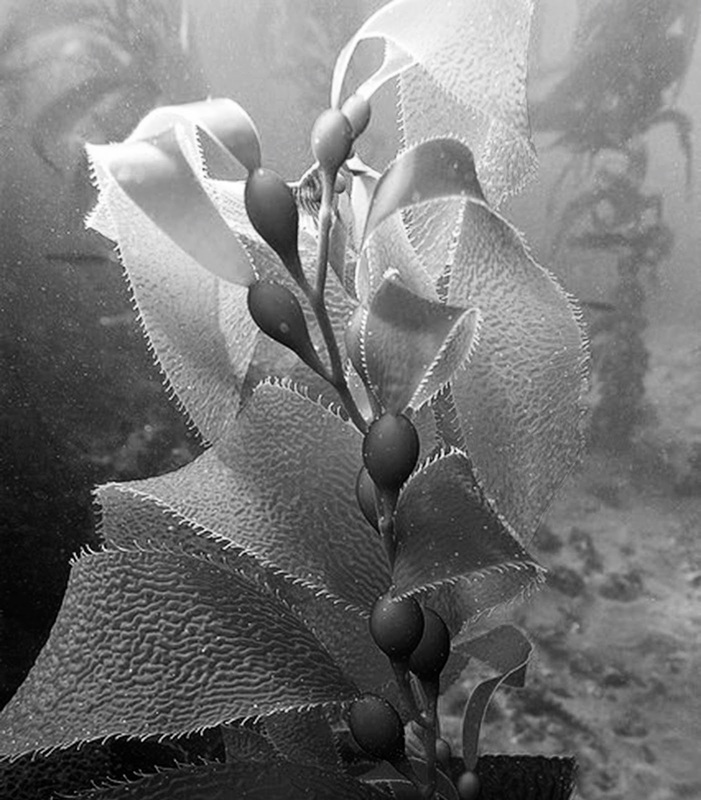 I altered the image of the kelp in my sketch to give it more movement and fill the space differently. A note for people who are frightened by potential copyright infringement issues; when it comes to using photos that aren’t yours for reference. It is ok to study photos to see how things look, what color an object might be in nature, or the texture it has. It is not okay to copy an image directly from a photo, and reproduce it in a painting or artwork. Instead, redraw things with differences, combine imagery from different sources in new ways, do not trace an image, change the arrangement, alter it and make it uniquely yours. Sometimes it can be helpful to create a black and white image to help see the gray values and where you need to put highlights and shadow. I made this one by putting the photo in photoshop and removing the saturation (color). 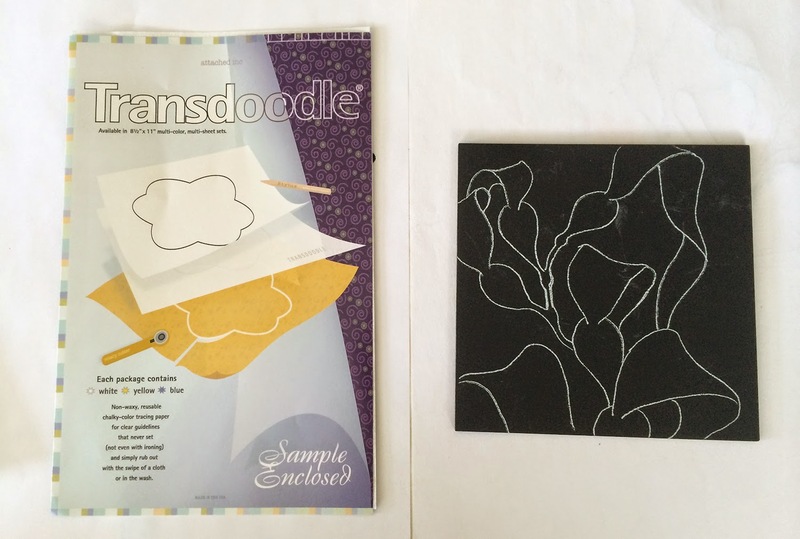 To transfer my design to the scratchboard I used a product by Mistyfuse called Transdoodle. This a chalk based pressure sensitive transfer paper available in blue, white and yellow, that you place between your drawing and the surface you want to put the image on. I began scratching the design into each area with a few light scratches in the direction of how I wanted my lines to go, being conscious of drawing curved lines on a round object to reinforce the contour of the shape. Also remember not to put too many scratches in the areas that need to remain dark. As I worked the design, I wiped away the residual chalk lines. A paint brush or soft cloth works well for that. Build up the highlights on the image slowly, once you scratch away the black to white you can't go back and make an area darker. Try not to over work areas and lose the range of values from light to dark. It’s easy to go too far when your mind is so used to making things darker instead of lighter. After putting in all the light and dark values of the kelps ribbon like blades, I added the ripply surface texture by angling the blade of an exacto knife to make little scratches. I love the strong graphic contrast of that black background. 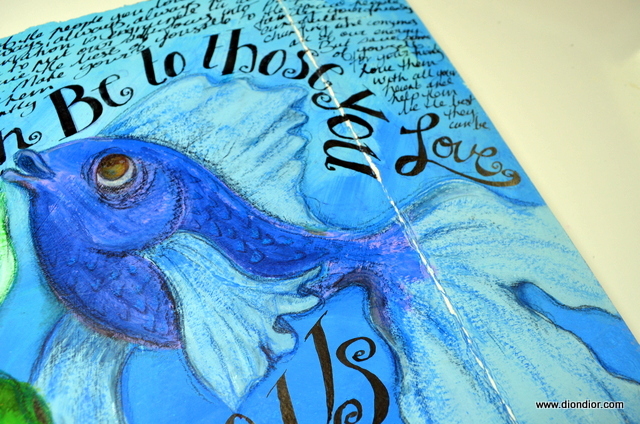 You can also add color to finished scratchboard images with clear inks. Dr. Ph.Martins India inks work really nicely, or in a pinch you can use felt tip markers. 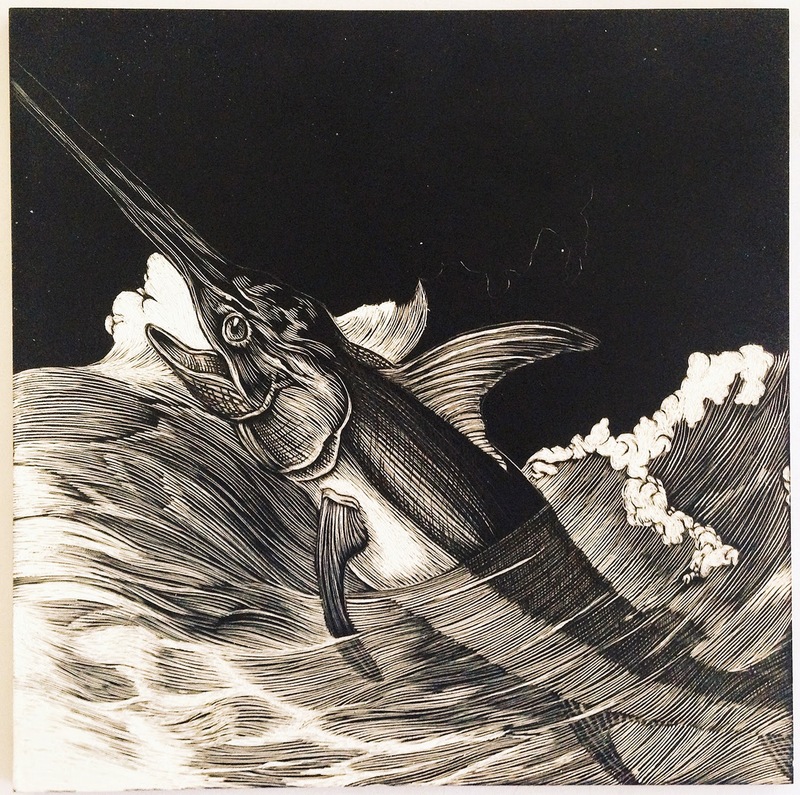 My daughter Indigo created this beautiful swordfish with her scratchboard. 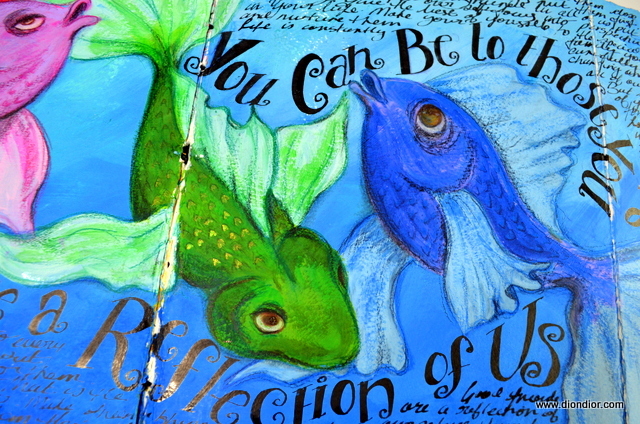 As much of our country struggles with drought, I want to encourage you to think about beautiful bodies of water like ponds, lakes or oceans, as rain that falls from the sky, as a home for a multitude of creatures and plants and make some art to honor it. 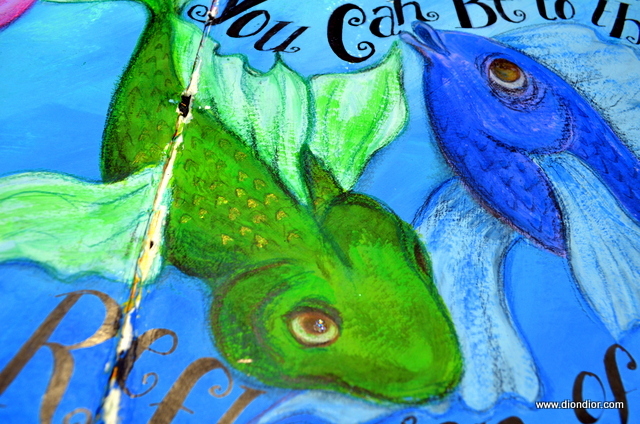 The last day of each month we have a slide show of the Sketchbook Challenge Flickr group's work for that month's theme. To have your work in the slideshow at the end of this month, be sure to tag it on flickr with jun638.